I am no bagel expert , I do not claim to know the hall marks of the ideal bagel, nor do I know the best way to eat a bagel. Turns out that bagel eating is a pretty democratic process, as I have found on reading many discussion boards, such as this Chowhound board and this Serious Eats board. I am always craving for this bagel – it’s a whole-wheat everything bagel (well toasted) with Scallion Tofu spread. Wait – did I just say whole-wheat everything? Don’t you have to choose between a whole wheat and an everything bagel? Well, not in this case. What is Scallion Tofu spread? Read on to find out more. Folks, go to Bagel Cafe in Murray hill and you won’t regret it. What’s the name again, you say, it can’t be just Bagel Cafe, there has to be something more to the name. Well, it’s just Bagel Cafe. All I know about Bagel Cafe is that it’s in Murray hill and it’s often very crowded on a weekend afternoon, so you have to go with someone to reserve a spot if you want to sit and enjoy the bagel at one of the few tables in the outdoor seating area. I am not comparing this bagel to one from H & H Bagels or to one from Ess-a-Bagel or from one of the other famous places in NYC (listed in this Chowhound discussion and this CBS local news page). My bagel experiences are from a small subset of places where you can get bagels – including Starbucks, work cafeterias, Tal Bagels in the Upper East Side, etc. I am aware that it’s not much of a basis to claim superiority over, but then this is one bagel you will not forget after you eat it. Why would you not forget this bagel? May be because it has perfect proportions of everything on it – onion, garlic, sesame, poppy seeds, and salt crystals. Or may be because it is made on location. Or may be because it was well toasted, the way I like it (although according to this NY Times interview with a Bagel Expert, only day-old bagels need to be toasted!!). Or may be because it is the perfect combination of being crunchy outside, chewy but not dense inside, not sweet, and not too dry (not after it is toasted, though). Or may be because the service is really good every time that I have been there over the last few years. The Scallion Tofu spread is deliciously light and (suspiciously) creamy, although the cafe claims that there is no cream or cheese in it. I am not sure tofu and scallions can taste this good, it tastes like cream cheese without an iota of tofu in it. 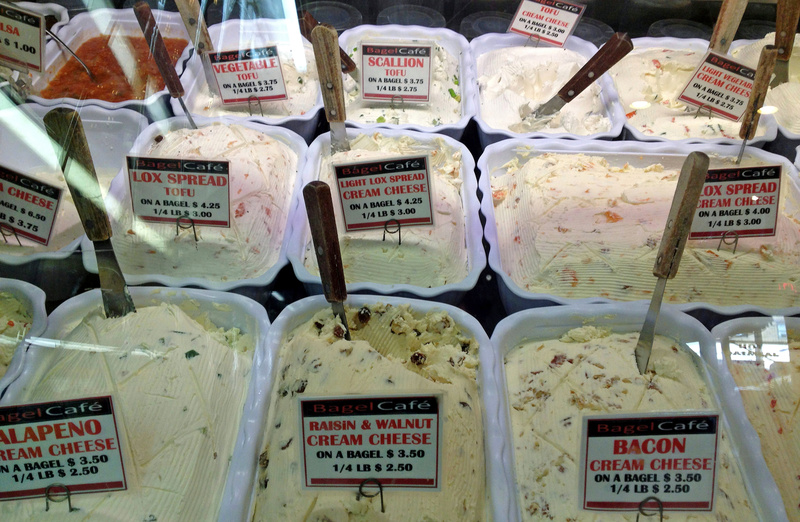 Bagel Cafe serves other light cream cheeses too – Vegetable tofu spread, lox tofu spread, light lox spread, plain light cream cheese, tofu cream cheese, etc., as you can see from the pictures here. 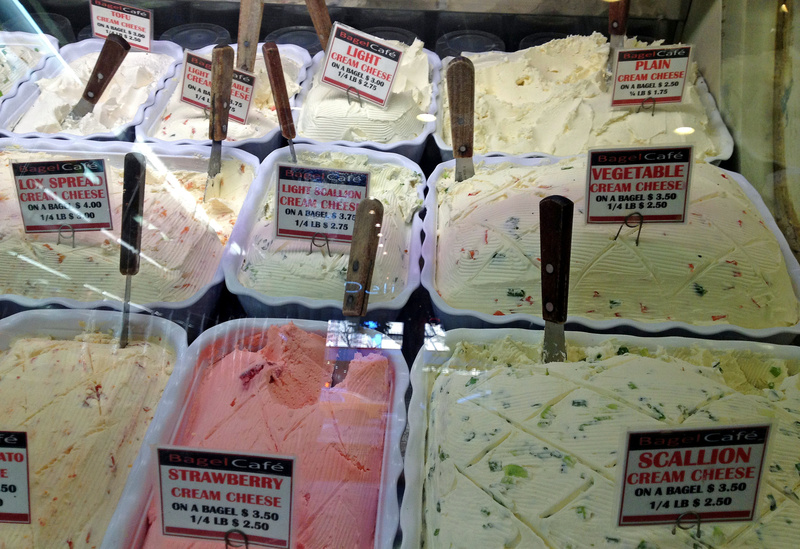 In many other places, they seem to have just plain light cream cheese, and not light cream cheese in any other flavor. Why is that? I wonder. Cafe owners if you ever read this, please note that customers like cream cheese in as many flavors as possible. Vic’s Bagel Bar in Murray Hill apparently served many flavors of cream cheese, but has since succumbed to Super-storm Sandy. 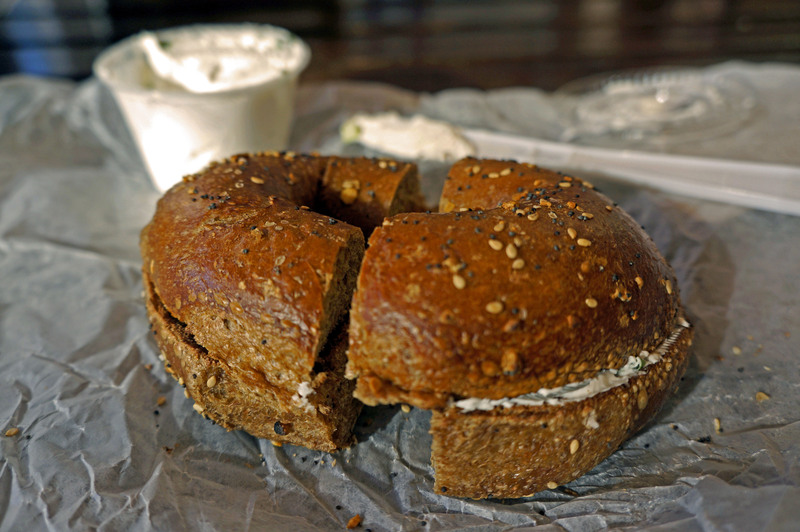 Bagel Cafe offers many cream cheese flavors to-go and while these do not have calorie content listed, these cream cheeses can give any of the spreads stocked at Whole Foods a run for their money, when compared on taste. Watch out for another post in which I will tell you what my favorite brands of spreads are and what flavors I love. I took a small box of Scallion Tofu spread on the side and the Raisin Walnut cream cheese spread to-go. Here is a shocking discovery that I made when I got the spreads to-go. They came in a box that I thought would hold one to two ounces of spread. They are filled to hold up to a quarter of a pound, that’s four ounces!!! I noticed that when I checked how much they had charged me. Every time I have taken the spread on the side with the intention of exercising portion control, I have consumed the entire box. That’s like consuming 500 calories!! You, reader have now been warned about the peril of taking cream cheese on the side. I left Bagel Cafe feeling satisfied with my choice of breakfast / brunch for the day – a Whole-wheat everything bagel with Scallion Tofu spread sounds healthy, right? I love bagels. my favorite is the whole wheat bagel with egg white veggies at dunkins…cheap and best !! Thanks, have never tried the Dunkin ones – good reason to try them, since you like them. ← In the New Year, I wish you all good Health through Food….